Online portfolios, web galleries, social media, blogs - the internet is packed full of platforms and portals for illustrators to showcase their creative talent. With so much choice available, which sites to choose? Regular contributor and digital artist Paul Morton navigates his way through the cyber jungle. "I still marvel at how new clients, in say Australia, can be in contact about a new job and within seconds they're checking out my latest work and downloading samples"
We artists and illustrators are not particularly famous for being vociferous self promoters. But the shortest of freelance experience soon makes it glaringly obvious that if we don't shout out about how brilliant we are for ourselves, we are very soon going to starve in our cliched garrets. Yes, there are agents who can amplify our greatness, and many artists swear by them. Some at them! It used to be a matter of assembling a fantastic portfolio, getting cards printed, seeking out the most relevant and up-to-date list of commissioning editors and then getting out there and doing some real 'Face Time'. These days of course there is absolutely no excuse for failing to have at least one sparkling, professional online shop window. In this article I'm going to take a quick look at the options out there for illustrators wanting to present to the world. It shows my age when I still marvel at how new clients, in say Australia, can be in contact about a new job and within seconds they're checking out my latest work and downloading samples. At the very same time an editor in perhaps Calgary, is flipping through my online Picture Book dummy and following the hot links to my apps. Amazing and wonderful - but the choice of online options is overwhelming, and can quite easily demand a full time job just to manage and upkeep efficiently! Remember those plate spinning cabaret acts? Well running a number of websites and social networking sites is pretty much like that. There are a few broken plates on MY floor but hopefully I manage to always keep a handful spinning. In fact at the time of writing this I have around 20 online presences where my work is legitimately displayed. I guess the various sites fall loosely into categories such as websites/homepage, social networking sites, online portfolios/galleries, shop fronts, workplace/job swapping discussion sites, scrapbook / pinboard sites, however they do fluidly overlap and share space. The most useful and most visited online space is my home web site. Although there are lots of excellent, and free, self-creation web services, I opted to pay to have mine developed. It's currently built in Wordpress. After Contact, (see below), my website is my 2nd most important source of new work. If you don't yet have your own website then a blog or simply a Facebook page is an absolute must these days. Wordpress and Blogger are two of the most popular sites for creating web pages and blogs. They give ease of access, 100s of useful templates and are backed by lots of professional and powerful features. My second busiest and most upkept site is my Hot Frog Blog, created in Blogger (owned by Google). And it's worth remembering that all the images that are posted to your Google blog will automatically be collected into one vast Picasaweb chronological image album, and available to view/share. I'm not sure if my blog does actually bring in much new work but it seems an obligation as well as a very useful and practical way to keep a record of all my most recent work. I know SCBWI writers treat their blog almost as a longer term, ongoing WIP and find them invaluable. This is my number one source of new illustration work and directly due to the fact that this is a tied in deal with the printed illustration directory 'Contact' book. At around £1200 for a double page spread it's not cheap but I've found it cost effective. In the package you also get the online gallery portfolio plus another tied in deal (20 free gallery images) with the American Serbin Directory of Illustration (see further below). $465 per year for a portfolio of 24 images. Your portfolio can be edited at any time, with a searchable tag engine. It's user friendly, inexpensive and a very effective at procuring new work. Make sure you keep your work up to date, and your search tags apt and lively. $650 per year for a gallery of 24 images (plus one time set up fee of $100). The ispot describes itself as a portfolio and rights managed site, has lots of extras that you can upgrade to. I tried the stock image section for a while but had no sales probably due to the wrong choice of images. Free via Contact, you get 20 images on their portfolio site. Serbin also produce specific themed portfolio sites for the games industry, children's books and medical illustration etc. This is one such themed site, and a reduced rate of $25 per month via the Contact deal gets me 20 images on their games and children's books gallery. Canadian based, after 2 years its usefulness is still pending. Prices from $250 per annum. 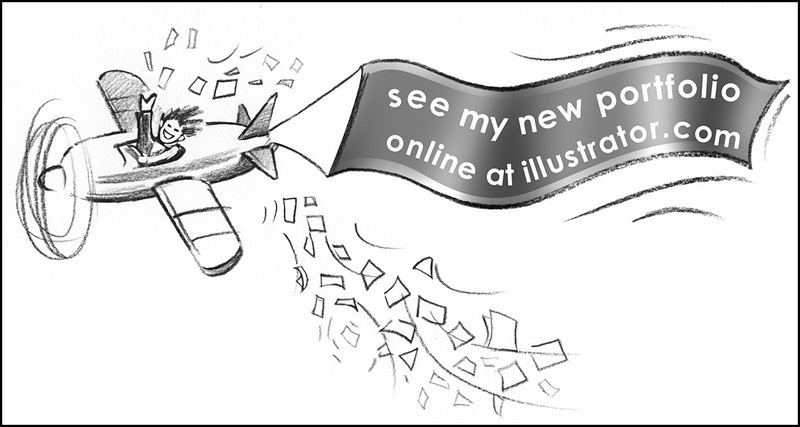 One popular site that I've not yet subscribed to is www.hireanillustrator.com, a UK based site with 400+ illustrators, and recommended by some SCBWI members. Having investigated the details for this article I am about to try it myself as it does sound convincing. From £4 per week you get an unlimited number of images in your gallery, but uniquely they mail out promo packs to clients so effectively you're getting work in front of up-to-date contacts. I first discovered ISSUU a couple of years ago and have come to love its simplicity, effectiveness and professional slickness. ISSUU hosts 14 million publications online, presented in a print-like interface that gives the reader the experience of flicking through page by page. You'll find up to date children's publisher catalogues, 500+ page Photoshop "how to" books - yes, in their entirety! As well as previous month's magazines on fashion, 3D graphics, painting etc etc. Titles that are still on the book shelves are archived there - for free! But the reason I've come to rave about it and wanted other SCBWI members to know about it is that with a bit of ingenuity you can use it for excellent self promotion. Firstly, it's easy to create and upload a specifically tailored and dedicated page flipping portfolio. It's also a great place to host your working PB dummy. Now any art editor, anywhere in the world, at any time, can be sent a link, can take a look through your latest PB project - and reject it within minutes! To create my Publishing Portfolio, I first designed each portfolio page layout in Photoshop, saved each as a jpg, then assembled all the sequential jpg pages into a PDF presentation (still within Photoshop) before uploading the presentation to ISSUU. Once on ISSUU you can embed hot links to other work, websites, email etc. You're allowed 3 private publications, such as PB dummies that you wouldn't want everyone to see, all other works must be public. With so many publications on ISSUU there are bound to be some copyright issues so it might be prudent to check that someone else has not already added some of your books illegally! It has been known. To finish with, in no particular order, here's a list of other sites well worth checking out. Free web creation with e-commerce options, upgrade and pay for more features. "Create a Free Online Portfolio. Choose a design. Customize it with ease. Publish online instantly". The SCBWI Illustration Showcase is a Wix site, and so obviously Wix is also good for creating an online portfolio/gallery too. Build a free website or a shop. I've tried this, good but not as slick and smooth to run as ISSUU. Like ISSUU but I've not really tried it out. Free portfolio/gallery hosting, job marketplace. Where 'finders' meet creatives for networking, collaboration and inspiration. The place to go for photography hosting. One free terabyte of space, perfect for an online gallery. Ladybird Books don't take submissions but do ask you to upload illustration samples to their Flickr account from which they might pick future artists. A more business orientated FaceBook. Meet art directors and commissioning editors online. Well known of course, and can be excellent for showing promo animations/videos for your books, how-to demonstrations etc. Free platform to showcase and discover photography, graphic design, illustration, and fashion. Owned by Adobe. A free slide presentation hosting service. Often called "YouTube for slideshows". 16 million registered users. $8 per month. Website and online gallery creation. Create websites, mobile portfolios for iPad, From $19 month. $9 per month online portfolio/gallery. JacketFlap is a comprehensive resource for information on the children's book industry. 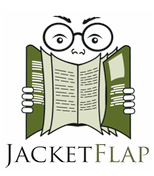 Thousands of published authors, illustrators, librarians, agents, editors, publicists, and publishers visit JacketFlap every day. JacketFlap also has the world's largest database of information on children's book publishers. A marketing and recruitment site for artists and photographers. Free to upload a portfolio. Lots of upgrade options to pay for. A marketing database. your $95 membership entitles you to an online gallery plus profile. Create your online portfolio in minutes. No coding skills required. 70,000 + creative people use Dunked to showcase their talent. $16 per month online portfolio website. Create your own free website/portfolio, with upgrade options. $19 per month, portfolios created and presented wherever you need to showcase. $7 per month, create beautiful online portfolios that seamlessly display across any device. Create online portfolios for free. An important top source for professional illustration and photography portfolios. Similar to Contact in that it's tied in with a print directory. Prices from $800 to $3,350. Showcase, share and sell from $5 per month. A meeting place for illustrators with regular illustration challenges and competitions. Another free online gallery for visual artists, upgrade to pro sites from $10 per month. A vast free, site featuring a whole array of artwork styles, with print sales and especially good for fantasy and 3D artists. The professional body for illustrators. £186 gives you membership for a year with all its associated benefits plus an online gallery of 24 images. Micro blogging site, hosting over 150 million blogs. Repository for interesting articles. Created in 2009 is now 3rd behind only Facebook and Twitter as the most popular Social Networking site. Online Pinboards can be used as shop front, galleries and portfolios. Also, for writers, Pinterest is used for scrapbooks of plot details and theme boards as aids to writing. Easy to use yet powerful collaborative 'wall of ideas', images and articles for storing and sharing. I'm just beginning to appreciate the usefulness of Padlet. A huge and respected directory of children's illustrators. Prices for an online 30 image gallery start at $25 per month. For a premium rate of $250 per year your work in an e-book gets mailed out to 10,000 art buyers. They also print an annual directory and you can download and view each year's entire annual online here. Illustration galleries and news forum - join and get online for free. From $5 per month, create photo and illustration gallery websites. Mainly US based illustrator directory. Free as far as I can tell. An excellent site for selling your hand made artwork and craft items. Use it as a gallery with shop attached. I know people have have earned thousands from their Etsy shop. 'The' place to sell your artwork to others. One of the top and most respected sites, have your work featured on T shirts, iPad cases etc. Here are two final sites from artists' agents representing top illustrators. Obviously there are loads of artists' agents and their online gallery sites. You would need to approach the agency in question to get accepted onto their books before you can then appear on such a site. I'd love to get some feedback from other SCBWI members, please let me know about the sites that have worked for you, the ones you dislike and of course the ones I've completely missed. And be sure let me know as soon as you've received your first new job as a result! 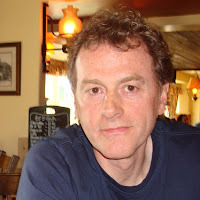 Paul Morton is an illustrator, SCBWI member and member of the WOrds & Pictures editorial team. He is based in South Yorkshire. His Design Studio is Hot Frog Graphics. Read Paul's blog here. Wow Paul, you're amazing! To know all this and to share all this too! The only thing I worry about is that I'm so bamboozled by the internet and all the upkeep needed that I wouldn't know where I'd find the time to do the work as well! Thanks so much for your generous advice, it's inspiring! What a great reference resource. Thanks, Paul. It's on file now. Paul, this is a great article! I am familiar with all the online portfolio sites you've mentioned, and are on a few of them including Hire an Illustrator which I feel does a great job promoting your work. This would be one of those articles that would be saved under the heading of great resources! Thanks for all your research! Oh, I should point out that the AOI Portfolios is only £36 a year to members. A great deal and images are up to 1064 pixels at their longest side. If you haven't looked at the redesign of AOI's website - go have a look now! This a great resource, Paul. Thank you so much for collecting all this info. This is a goldmine! Thanks for all the work you have put into this - its hard work updating and promoting so articles like this help us all so much. This is going to be invaluable once I've finished my course. Thanks Paul!